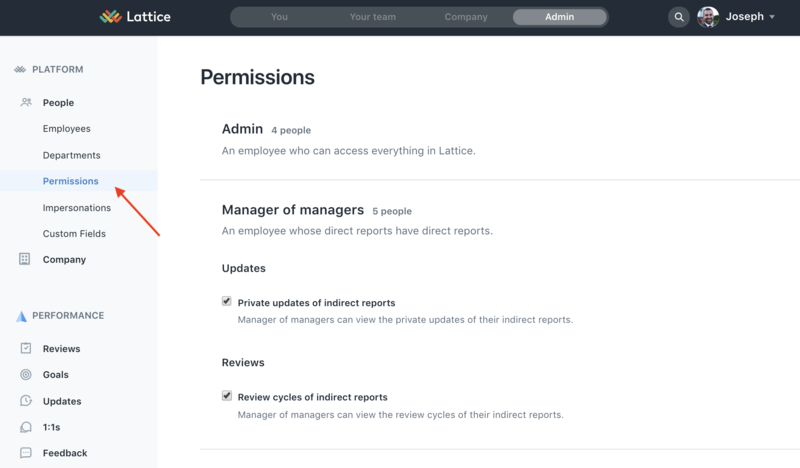 Admins always have full visibility into all updates that are posted within Lattice, whether they are shared publicly or privately. Managers can always see the updates posted by their direct reports, whether they are shared publicly or privately. Depending on the needs of the organization, admins can configure whether or not a manager of managers can see the private updates posted by employees within their org. To do this, go to the administration section of Lattice and navigate to the Permissions panel from the left-hand side and then click on Permissions. Then under the "Managers of managers" heading, find the Updates subheading and check the box to allow managers of managers see the private updates from their skip level reports. By default, Taylor can see the all the updates that Susan has posted and Tiffany can see the updates posted by Samantha and Sarah. Checking the box would allow Alice to also read the updates posted by Susan, Samantha, and Sarah. Manager of managers can read the updates from an employee's user profile.